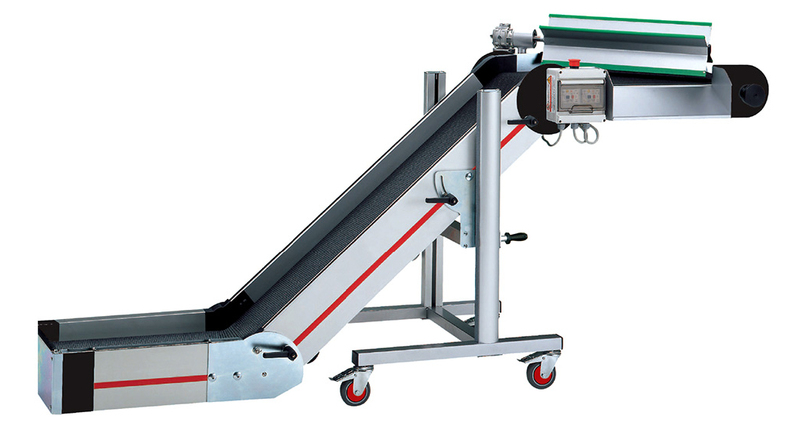 The belt conveyors are suitable to meet the multiple needs of collection, transport, and separation of molded or blow-moulded pieces on injection and blow molding machines. The NDS series is a double-bent flat belt conveyor having a lower part for the collection of pieces, an inclined part for the transport and a flat upper part used for separation. Adjustable height, slope and the two angles between the sloping and flat parts. It is usually supplied with a PUR high-grip bulged belt. Smooth belts with strips are also available. It is equipped with a plate metal detector. 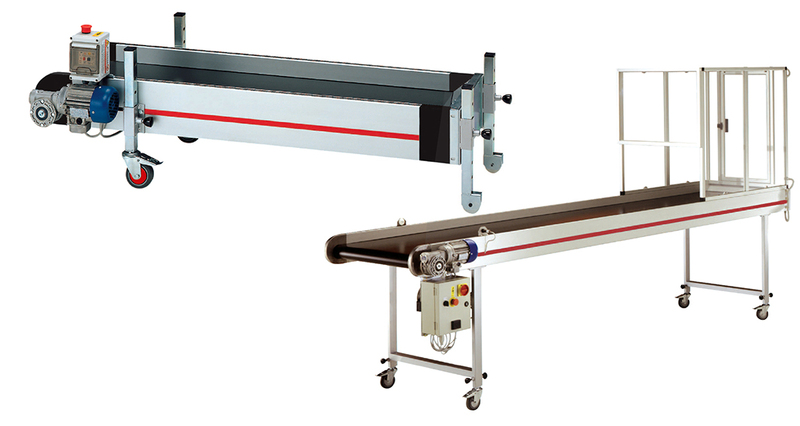 Also available is the ND series, double-bent fixed belt conveyor where the angle between the bent part and the lower and side parts is fixed. •Quick adjustment of height and inclination. •Installed on rotating wheels with brake. •PUR belts: smooth, smooth with flights or high-grip bulged. •Belt speed of 3 m/min. •All machines are equipped with safety devices and have been manufactured in compliance with european standards. •Electronic control panel with robot signal for programmed operation. •Electronic control panel with 2-cycle timer. 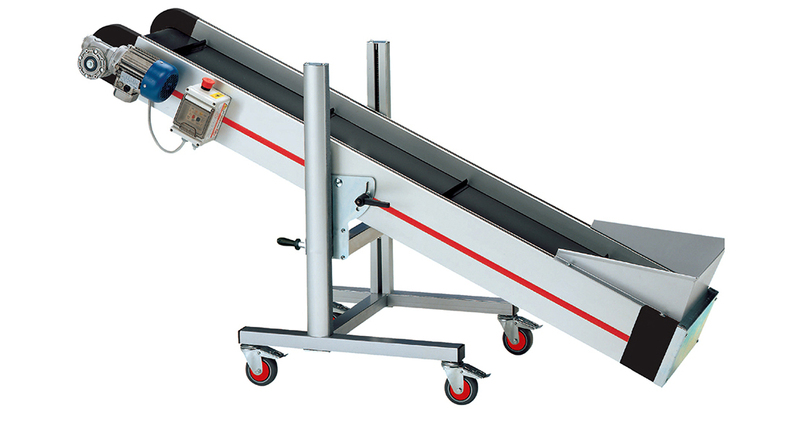 •Belt speeds available: 1,5–6-9-12 m/min..
•Mechanical speed controller with manual-adjustable motor speed control from 0 to 20 m/min.. •Plate metal detector. 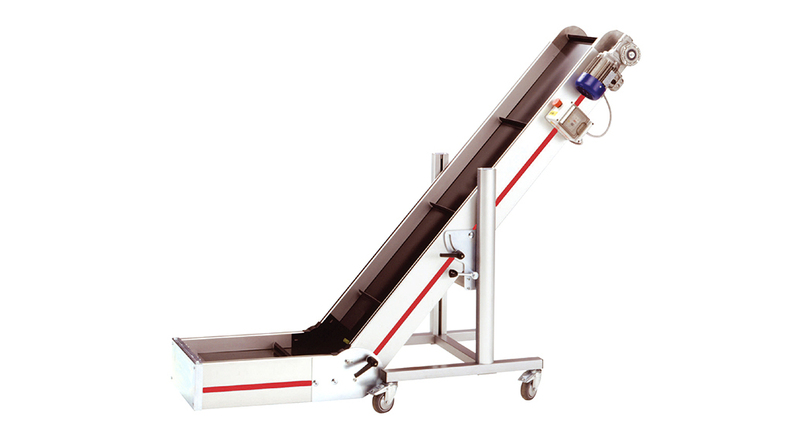 •Separator system for parts from runners. •Tailor-made sizes. •White belts for food applications or reinforced belts for high temperatures.